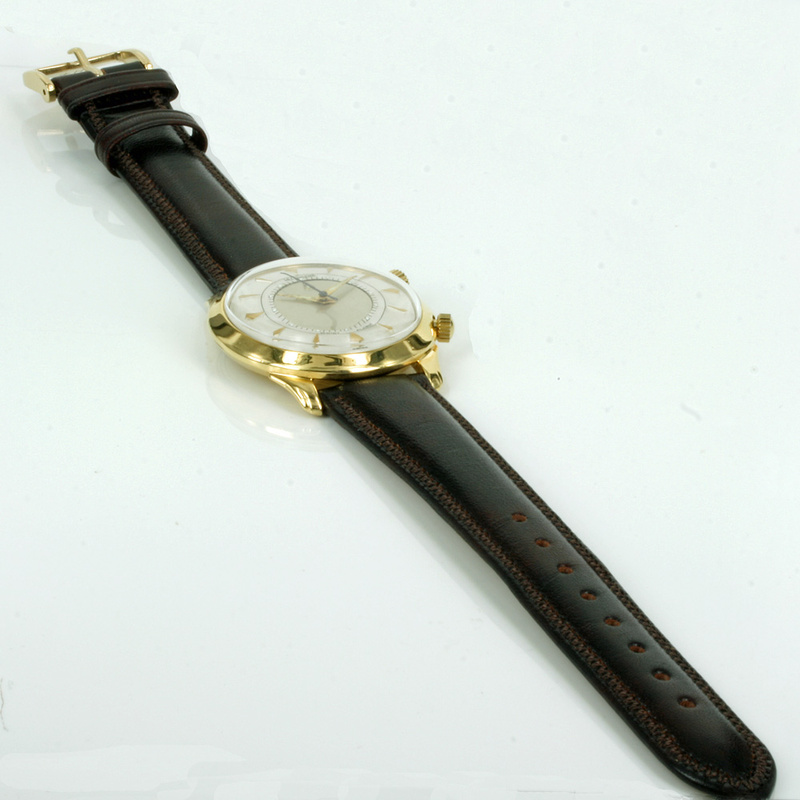 Product code: ES3130 Categories: Sold Items, Sold Watches. Jaeger LeCoultre have produced so many innovative designs in its esteemed watchmaking history such as the Jaeger LeCoultre Reverso, the Atmos clock, the Futurematic and as we have here the Memovox. First produced in 1950, the Memovox has the distinct style and sound to it thanks to the alarm function which is wound by the crown near the 2 o’clock and the time set by turning the crown and rotating the inner circle of the watch where the triangle indicator is. (On the photos, it is currently set ti 12 o’clock). 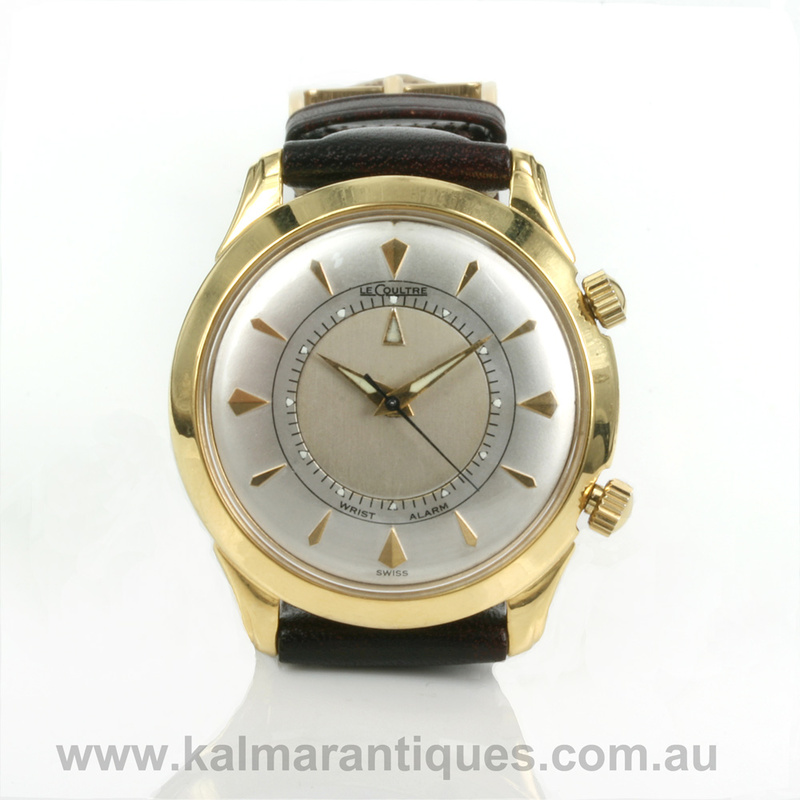 The case is 10ct gold filled and measures 35mm across plus the two crowns and the dial has been expertly repainted to its former glory. With an easy to read dial, it is signed just LeCoultre as opposed to Jaeger LeCoultre as this watch was sold in the United States and Jaeger LeCoultre was already copyrighted by another company. The manual wind movement has undergone a full restoration and runs brilliantly and comes with our twelve month warranty. Jaeger LeCoultre have always made such high quality and highly sought after watches and the jaeger LeCoultre Memovox is certainly no exception. A true classic vintage watch.